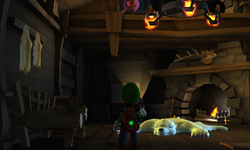 The Chalet is a room inside of the Secret Mine in Luigi's Mansion: Dark Moon. The Chalet is accessed by taking the north door outside of the Chalet Approach. The Chalet has a rocking chair and a polar bear rug by the fireplace. There is a Pixelator here as well as a shelf with containers. The Chalet also has two cabinets, a vanity with a mirror, and a couch. The fireplace serves as an elevator to the top of the floor where the chandelier can be adjusted. Purple and gold Fuzzballs can be found in the Chalet in every mission. The door to the south leads back to the Chalet Approach while the door to the north leads to the Smokehouse. Starting in the second mission, Hit Rock Bottom, an elevator to the Airway is made available in the Chalet. During Cold Case, Luigi must go through the Chalet to reach the Fishing Hut where the Toad assistant is being held. When Luigi enters the room, he has to fight two Hiders and a Sneaker. If Luigi tugs on the polar bear rug's tail, a Gold Greenie pops out from the mouth. In Hit Rock Bottom, Luigi must take the elevator to the Airway in order to get to the basement. During this mission, there is a purple creature sleeping and a gold creature inside of a cabinet. The rocking chair is missing and shining the Dark-Light Device in the area it originally was reveals this mission's Boo. In Across the Chasm, the Chalet is covered in snow and the elevator is encased in ice. In order to melt the ice, Luigi must use the elevator in the fireplace to reach the top. After closing the window, he can raise the chandelier to light it, and then lower it to melt the ice. the The Strong Slammer also hides in this room once Luigi encounters him on the way to the Gondola. During Severe Infestation, the Chalet may be one of the rooms infested with ghosts. Only in Across the Chasm and Severe Infestation, if Luigi takes the E Gate in the Crystal Quarry, he falls onto the couch inside the Chalet. This causes a sapphire that was wedged between the cushions to pop out. This page was last edited on September 11, 2018, at 02:16.